First off, happy Black History Month to everyone. And Happy Groundhog Day. Put on your booties, cuz it’s cold out there today. So, I rounded up a group of nine friends and invited them into the project I talked about in a previous post. I’ll begin with by expressing my thanks and encouragement to them for revealing to me, again, the joys of collaboration. The timeline: About a week ago I started soliciting nominations from those folks for a favorite hip hop artist, track, and album with no overlaps. Ideally, it would be something they are listening to currently, that’s making an impression on them now (whether it’s new or not). Then I made two Spotify playlists for people to listen to (more on that later). Officially, the February installment of Hip Hop Book Club started yesterday and runs for the whole month — the idea being that it’s not too much to think that someone could get familiar with twenty tracks (from the artist and track noms) and ten albums (from the album noms) over a month. Group.Me: I’m enjoying dicing all of this new music up with a running commentary on a Group.Me we put together that has everyone on it. Some folks have yet to jump in, but I like to think about it as an going chat about hip hop culture, jokes, memes, etc. that we can all share. I’ve enjoyed this part the most. So what do I do now? If you’re a member of the club, we’ll expect you to live in those two lists for the month. One you should probably spend time learning backwards and forwards (the artist/track list). The other you can use like a radio on shuffle, or pick different albums to listen to depending on your mood, or, if you like games, but it on shuffle and see how quickly you can guess what comes out of the speaker first. Get familiar with this music and remember that whatever is coming to you through your speaker has hand-chosen by someone else in the group with care. They really wanted you to hear it and know it. I’ve been doing my listening homework a lot already on the bus, on my bike, and during runs. Who wins? At the end of February, I will send out a poll for you to to vote on a couple of things: best artist (across both lists), best track (across both lists), and best album. I might also take nominations for favorite line(s) and favorite backstory (as in, how did this song come to be .. probably from a review article or an interview). 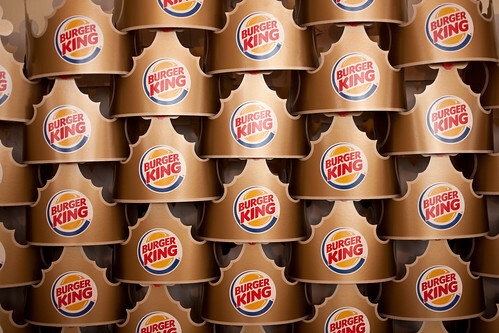 Then we’ll all vote, and if the artist, track, or album that you nominated wins, I’ll mail you a Burger King Crown. But even before that I’ll be taking nominations for the March playlists, so make sure to expose yourself to some new things. Yes, if you really liked something from someone else in February, you can nominate that for the March playlist.